Posted by CCLD in Beneficial Bits n' Bytes, Reference, Technology. Starcat, as you know, is our library catalog that gives you access to materials from both your own library, as well as materials from any of the Southern Tier Library System’s 48 member libraries. When conducting a search for an item, to the right of your search results you will see the “Place Hold” button. You can also place a hold by using the “Select an Action” menu. Both of these Hold paths are also available to you after clicking on a particular item for details. Click on the “Place Hold” button for the item you have chosen, a box appears to enter your library card number and your pin number, which is the last 4 digits of your phone number. Once you have entered this information, another box will appear that reads “Pick Up Library,” which through a drop down menu allows you to choose the library where you want to pick up your material. Even after the hold is placed you can log into your account, click on the “My Holds” section, and have the option to Cancel Hold, Edit Pickup Location, Suspend Hold which allows you to delay the start of the hold, or Cancel Hold Suspension, which assures the cancellation of the hold suspension. If an item is not available through our Southern Tier Library System, there is also the Interlibrary Loan System which provides access to library materials from other libraries across the country. Submit your request through the edesk (edesk@stls.org) or ask a reference librarian for assistance. Posted by ackermanj in Recommendations, Steele, Youth Services. It was with interest that I read CCLD’s blog entry regarding historical fiction by Caroline Poppendeck. I completely agree with her praise of this genre and would like to further “dig” into it, by including favorite historical fiction for Youth. Recently, a family approached me at the desk and were headed to Gettysburg to view the Civil War re-enactments, honoring the 150th Anniversary of this famous battle (the young boy reminded me that it was the biggest and bloodiest battle fought on U.S soil). We headed to our large juvenile non-fiction Civil War section where there is a wealth of material to educate children; the juvenile fiction section is full of stories of this time in our American history as seen through the eyes of a child. A great picture book for the 3rd-4th grade level is Pink and Say by Patricia Polacco, based on a true story of a friendship between a young white Union soldier and a young black Union soldier; it is powerful and heart wrenching. Chapter book selections for those in Grades 3-6 include the following series: My America, Dear America, and American Girl. Good choices for Grades 5 and up, include Will at the Battle of Gettysburg by Laurie Caokhoven in the Boys of Wartime series which includes an appendix at the end on children’s roles during the Civil War, and The Red Badge of Courage, by Stephen Crane, both hold real reader appeal, with loads of suspenseful action, as the boy narrators of the stories are torn between their glorious expectations of war and the cold reality of its’ cruelty and harshness. A book written with some humor (a la Mark Twain) about this dark period of history, is The Mostly True Adventures of Homer P. Figg by Rodman Philbrick. Another Newbury Award Winning book is Across Five Aprils by Irene Hunt, about a boy who comes of age during the war years. Ann Rinaldi is the author of many books about the Civil War with girls as the main characters and they include: the suspenseful, An Acquaintance with Darkness, Come Juneteenth , My Vicksburg, and Leigh Ann’s Civil War. An audio book that we have at Central that is great to listen to as you travel to Gettysburg, or anyplace on your summer travels, is Don’t Know Much About the Civil War, by Kenneth C. Davis, this tells the human side of this war with humor and tenderness, as well as describing the battles and tactics of this war in a whole new light…informative and interesting listening for Grades 7 and up. All of these titles are available at the Central Branch (CCLD). Posted by patchettd in Recommendations, West Elmira. There are so many advantages to visiting your local library. One thing we see over and over at the West Elmira Branch is impromptu book sharing. A patron comes in and mentions a great book they have read. Another patron hears and asks to have the book reserved for them. Recently, we found a book that holds appeal to readers across many age groups. Ahnece, a staff member in the 25-35 age range, read The Fault in Our Stars by John Green. She could not say enough about the book and mentioned it to several patrons. This is what she says about the book: “John Green weaves, throughout this story, the most human of experiences-fear, joy, faith-emotional twists and turns that kept me wondering what could happen next. Under the shadow of inevitable death, Hazel, Gus, and Isaac experience sorrow, pity, laughter, injustice, love and ultimately, forgiveness. The ways in which the characters deal with their mortality, in exceedingly positive ways, motivates me to aspire to the same maturity in my own life. Ahnece recommended the book to a patron, Mary Ann, who also felt it was one of the best she has read. Mary Ann is in the senior age group and this is what she has to say about the book: “I like novels that speak to me-that reveal verities, those enduring truths that are truer than true. In The Fault in Our Stars, John Green speaks to me in poignant, understated language. The main characters, Hazel Grace and Augustus, ages 16 and 17, meet in a support group for cancer patients. John Green skillfully reveals their coming to know each other. He does this with the subtle, but so effective use of young banter and observations of their world. Early in the novel, when Hazel first meets Gus, she observes, ‘He smiles with half his mouth’. Later, when talking with him on the phone, she says, ‘I could hear his crooked smile’. At this first encounter, Gus is talking about his friend Isaac. Hazel says, ‘I liked Augustus Waters. I really, really, really liked him. I liked the way his story ended with someone else’. Later, she achingly wants to extend the day, ‘The sun was a toddler, insistently refusing to go to bed’. With the same longing, she says, ‘I felt like Anna in the book, that feeling of excitement and gratitude about just being able to marvel at all’. Gus’s character has a similar depth with a knack for saying something wise and dear. He and Hazel are composing an ad to sell a swing set. He remarks to her, ‘That’s why I like you…you are so busy being you that you have no idea how unprecedented you are’. He also says that people might not realize how difficult keeping a promise can be, but they must keep it anyway. Clarie, another patron, has recently begun to volunteer at the library. When she heard this discussion she jumped right in with her thoughts: “The Fault in Our Stars is an indescribably amazing book. Its combination of humor, tragedy, and love draws you in and helps you connect with the characters in your own personal way. In this book, two young people suffering from cancer meet, bond, and fall in love, unobstructed by their illness. It is a must-read for teens as well as adults. There will be a movie coming out with Ansel Elgort as Gus and Shailene Woodley as Hazel. The author, John Green, said on YouTube that he watched the auditions and had a bit of say in the casting. I doubt the movie will be as good as the book, however, I will definitely watch the movie. I only reread my favorite books, and The Fault in Our Stars is certainly one of them.” Claire is a teenager. We hope this inspires you to try this much loved book before the movie is released. We also hope this inspires you to join a reading discussion group, the CCLD Summer Reading Club, or the Online Book Club. You never know what gem you will discover. Posted by CCLD in Recommendations. This past month I read two new books I loved; one fiction and one nonfiction about aging women, that I heartily recommend for anyone who is looking forward to their own future or to that of their parents. 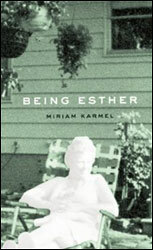 It’s not often that I feel characters in fiction to be true, but reading Being Esther by Miriam Karmel, a first time novelist who has been a journalist and magazine writer, was like listening to a friend to whom you can tell anything. In one passage she says that she can no longer close the clasp on her watch so wears her deceased husband’s Timex with an expandable bracelet but, because it is too big, it moves around her wrist. She then says it is just like her husband, reliable but annoying. I became very fond of Esther, a witty, practical eighty-five year old straight shooter who ruminates about her life and relationships. If you search the book’s title in our online catalog (STARCat), you can read reviews and a summary that describes the book much better than I can (click on the title of the book on the results page). The second book was titled Moving Miss Peggy : A Story of Dementia, Courage, and Consolation by Robert Benson. This is a nonfiction book by a son who describes how his family handled their mother’s aging with Alzheimer’s disease. The writing was lyrical but practical, with advice for others facing similar situations. Let me know if you like these two books as well as I did. Posted by poppendeckc in Recommendations. I was discussing historical fiction with a staff member. We both found it a wonderful genre. It can easily be overshadowed by contemporary thriller/murder/ intrigue-rich novels enjoyed by so many, and are so often checked out of the library. The irony is, history-based fiction is built on these elements, and includes so many more. Set anywhere from exotic locales to war-torn regions, these wonderful stories submerge us into worlds documented by historians but humanized by talented authors. Some of my all-time favorites include Sofia, by Ann Chamberlin. This is the first in a trilogy (The Sultan’s Daughter, The Reign of Favored Women), situated at the height of the Ottoman Empire, and is loaded with women behaving badly. This rich view into the world of a harem is mesmerizing and historically plausible. The Far Pavilions, by M. M. Kaye is set in the British Raj era. This classic is oh so memorable, covering the Indian caste system, and characters steeped in mortal choices. The Belt of Gold is by the very talented Cecelia Holland, and is based in Christian Constantinople. It follows the matriarchal- occupied seat of power in 9th century Byzantium. The author did not feel this novel her most successful, but I enjoyed the glimpse into this world nonetheless. The Terror, by Dan Simmons, is a fictional story telling of the failed expedition of Sir John Franklin’s search for the Northwest Passage in 1845–1848. It is a gripping tale of the extremes of human endurance, with Inuit mysticism added for a heightened level of spirituality. You can’t put it down. After polling other staff members for their favorites, they recommended Ken Follett’s Pillars of the Earth, Gone with the Wind, by Margaret Mitchell, Lady’s Maid, by Margaret Foster, and Helen of Troy, by Margaret George. They also assured anything by Philippa Gregory, Louis L’Amour, John Jakes or Jean Plaidy is not to be missed. They are all a treasure trove of humanity and history.